Biker tattoos seem to be an essential part of the uniform when it comes to serious motorcyclists. And the bigger the machine the bigger the tatts. Look round any motorcycle festival or motorcycle track day and you will come across biker tattoos of all shapes and sizes – the good, the bad and the downright ugly – which is good enough reason to encourage everyone, serious biker or not, to think before you ink. 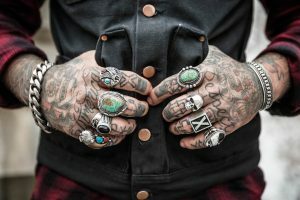 Tattoos are permanent, they should be thought about and carefully planned, and definitely not the result of a drunken whim after a big bikers’ night out. The serpent on your back might look great as a trendy young 20 something, but how will it appear when you are in your 70s? There are many people out there with tattoos done on the fly who now regret the result – they may no longer love “Rosie” or think “Metallica rocks”. Remember, ink in haste and repent at leisure. Here are some of the questions the experts at Bikesure, the free-thinking bike insurance broker, advise you to ask yourself before getting inked. Get a clear idea of what you want for a biker tattoo before you get it done. Ideally, do a drawing or take a printout of the type of design you have in mind. Look around online where there are hundreds of images to choose from such as these at Check Out My Ink. Think about where you want the tattoo. Do you want to be able to cover it up? There are some tattoo artists who won’t do facial tattoos because of the impact these have on the rest of the person’s life. If you’re feeling brave tongue tattoos are increasing in popularity and providing you don’t talk no-one will know it’s there but read the health advice before committing yourself. In the UK all tattoo artists have to be registered with their local authority Environmental Health Department. Check around your friends and find out where they had theirs done. If you see someone with a tattoo you like ask who did it. Most people are only too happy to chat about their tattoos. The Biker Guide has compiled a list of UK tattoo artists with customer reviews. Check that the studio is clean and sterile and get a price before the needle enters your skin. Once you’ve made the decision to go ahead make sure you leave enough time to get it done. If your tattoo artist has to rush you could be stuck with a bad tattoo. If it’s really complicated it may well take a few sessions. Remember the process involves needles and a certain amount of pain and discomfort. Your tattoo artist should give you advice about the healing procedure and subsequent care and products you can use on your tattoo. Still not sure? If you really aren’t bold enough for the full sleeve think about something more discrete which will not be visible in normal circumstances. A small motif on the ankle of the back of the shoulder may work and once you are used to having that (and you know how much/little a tattoo will hurt) you can go for something bigger and more visible. But beware – tattoos can be addictive and most people find they don’t just stop at one! Just take a look at David Beckham!